With this squad, I paid a bit more attention to the guts/tubes/tentacles in trying to make the detail stand out a little sharper. I also tried to switch up how I did the antlers and horns. For the guts/tubes/tentacles, I used Rakarth Flesh for the base, then went over it with a shade of Druchii Violet. After that dried, I went back over the raised details with Rakarth Flesh, followed by a highlight of Pallid Wych Flesh. That ended up with something that looks kind of like intestines. It came out pretty well for my first real batch of it. For the antlers and horns, I used the same colors I usually do (Zandri Dust, Agrax Earthshade, Ushabti Bone, Bleached Bone), but I did the highlights a little different. I’ve always done the traditional “cone” antlers and horns where the part closest to the model is darkest and working up to the brightest part which is the tip of the horn. Instead here, I tried to make the brightest part where I thought new growth lines would be. It makes for much more striated antlers, which I think look a little more realistic. 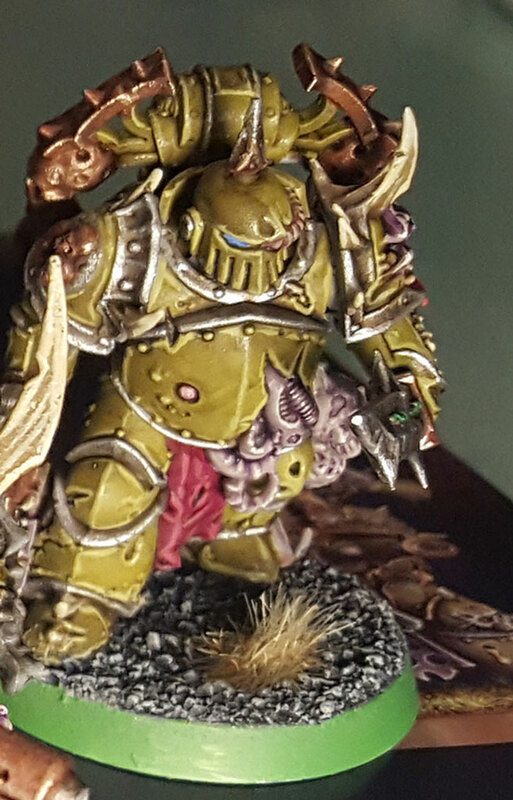 I’m going to try to refine the technique as I work on the Lord of Contagion and, later, the last of my Plague Marine squads. There are so many details on these models, and that really does present an opportunity to try new techniques and methods for painting. 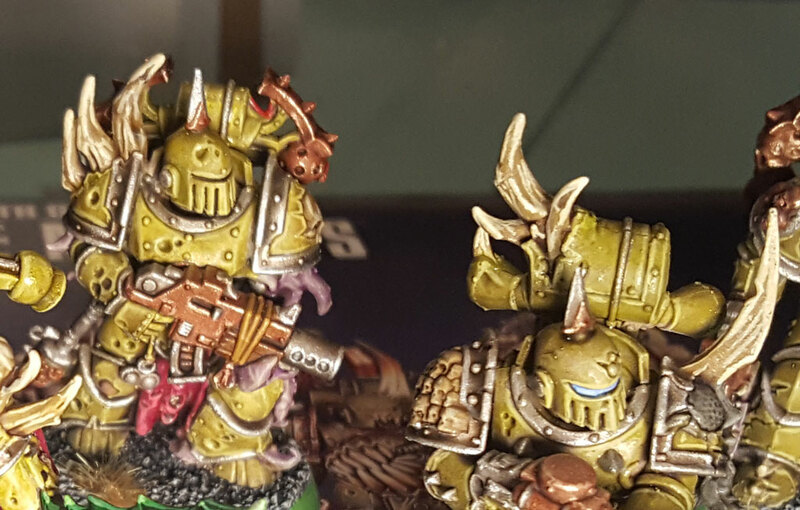 Looking at the pictures of the painted Foul Blightspawn and Biologus Putrifier on the Games Workshop site present some examples of stuff I hadn’t done or tried before. For example, the bottles and flasks on the Putrifier are done up to look like they are sloshing around with toxic liquid. I do want to try my hand at something like that, though I am a little intimidated. But getting out of your comfort zone is how you improve. That won’t be happening in the immediate future. I still have some stuff to complete for my ETL vow. 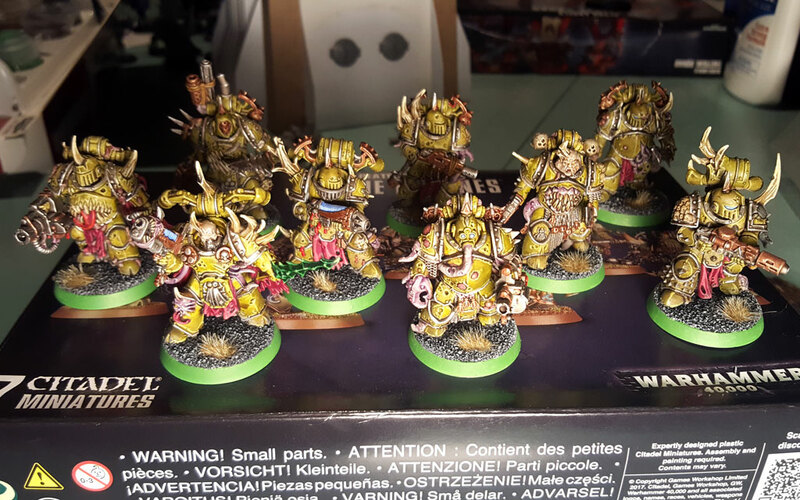 I’ll be working on a Nurgle Chaos Spawn and the Lord of Contagion next, so I’ll be posting up about them in the next couple of days.